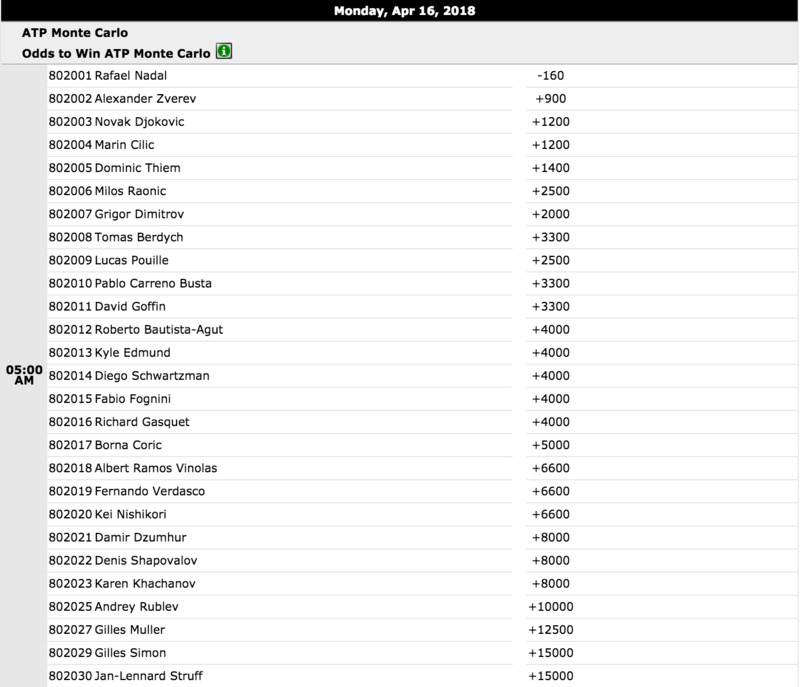 ATP Monte Carlo Outright Odds, Prediction: Will Rafael Nadal Go to 11? Rafael Nadal doesn't have feet of clay, but when he does have his feet on clay and a tennis racket in his hand, there are none better. Nadal and Novak Djokovic share the record with a total of 30 ATP Masters titles, and Nadal and Roger Federer co-own the mark of 45 ATP Masters final appearances. Nadal's 63 semi-final appearances are also an ATP Masters record. But it is on the clay court surface where Nadal dominates. He won at least one of the three ATP clay court Masters series tourneys every year between 2005-14. Nadal's lifetime mark in finals played on clay courts is 53-8. He's never lost a five-set final on clay. He's won 10 Monte Carlo Masters, 10 French Open titles and seven Rome Masters, all on clay surfaces. His French Open and Monte Carlo success stores made Nadal the first player to win two different ATP Masters tournaments 10 times each. Nadal captured the Monte Carlo Masters eight straight years from 2005-12 and has also won the event in each of the past two years. He's 63-4 overall in 15 Monte Carlo tournaments. Nadal is coming into his first tournament action since being sidelined by a hip injury, although he did help Spain defeat Germany in Davis Cup play last week. But if you think his game might not be 100 percent sharp and he could be susceptible to an upset, where should you consider putting your money? Well, look no further than Novak Djokovic. Djokovic is the reason why Nadal doesn't already own 11 Monte Carlo titles. He beat Nadal in the 2013 final, after losing to Nadal in the 2009 and 2012 Monte Carlo finals. Djokovic is 30-9 all-time in the Monte Carlo event - he also won the title in 2015 - and he's back working with his old coach Marian Vajda. Djokovic actually holds a 26-24 career edge over Nadal in head-to-head matches, but Nadal carries a 15-7 advantage on clay surfaces. Djokovic defeated Nadal on clay in the 2015 French Open final, ending Nadal's 39-match winning streak at Roland Garros. Which Wagers Make The Most Sense? Nadal opens at odds of -160 to win Monte Carlo, and without hitting a ball, his route to victory is already looking smoother. He received a first-round bye and will face the winner between world No. 53 Aljaz Bedene and qualifier Mirza Basic in the Round of 32. The world's top-ranked player also won't be required to deal with world No. 2 Roger Federer, who has opted to skip the clay court season and focus on defending his title at Wimbledon, not that it would have likely mattered. Nadal has beaten Federer in three Monte Carlo finals. 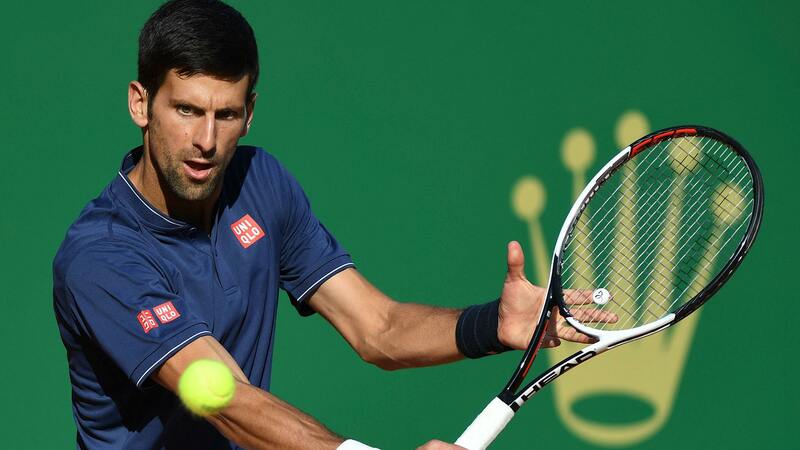 Surprisingly, you can get +1200 odds on Djokovic winning Monte Carlo. The way the draw has fallen, Djokovic and Nadal could clash in the quarter-finals. Dominic Thiem is set at +1400, but the world's seventh-ranked player is returning from an ankle injury that's sidelined him since mid-March. 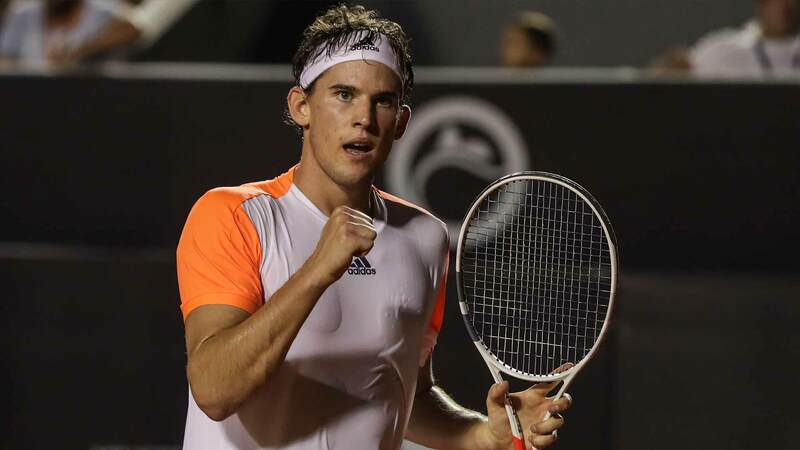 Thiem has won seven of his nine career ATP titles on clay, but is 3-4 at Monte Carlo. World No. 4 Alexander Zverev is the second betting choice at +900. Nadal dropped him 6-1, 6-1 in the third round here last year. If you are a trend follower, the last three ATP World Tour Masters 1000 tournaments have been won by first-time champions. Zverev and Thiem would both fit into this category, as would Marin Cilic (+1200), the world's third-ranked player. He was the last player to face Nadal in a tournament setting at the Australian Open. The last two losing finalists in Monte Carlo - Gael Monfils (42nd) in 2016 and Albert Ramos-Vinolas (23rd) in 2017, both sit well down the world rankings, so a longshot is not out of the question.